This is the most personable, loving cat you will find. It's with great pain that we are listing Oswald the Sphynx cat, but we have opportunity to travel and the house sitter is not interactive with pets. He is 16 months old, declawed, neutered, shots up to date, and HAIRLESS !! Ozzie comes with his favorite house, food, litter, litter box, toys, etc. He is a wonderful cat, more like a dog, great with kids and all ages.... absolutely loves to cuddle up and purrrrr, sleeping in bed like a human, and then playing like another member of the family. 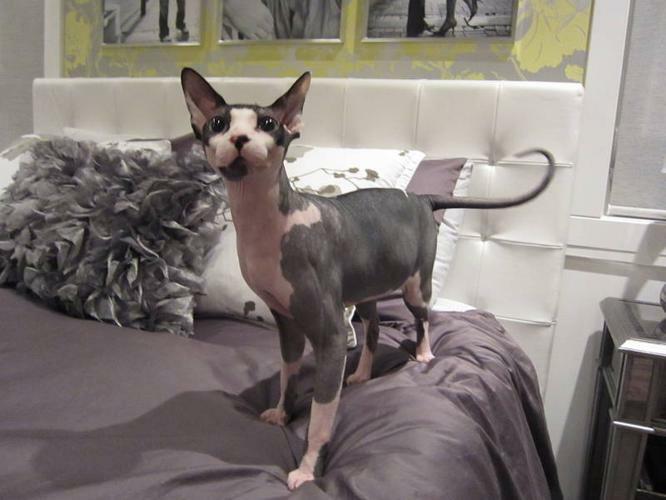 Please email me for a link to a video to show a bit of the unique side of a Sphynx cat, "Ozzie" the Sphynx cat. More important than the $800 asking price is that he goes to a home that is going to love him and give him the attention that he requires. Adult Male Cat - Domestic Long Hair: "Eli"
male neutured declawed grey tabby needs a loving home!